React Physical Therapy at TCBOOST headquarters is proud to be the the official NFL Combine Prep physical therapy partner with TCBOOST. John Kim received his bachelor’s degree in kinesiology and his Doctorate in Physical Therapy from the University of Illinois-Chicago. John enjoys working with the orthopedic and sports population across all age ranges and prefers a whole body, hands-on manual approach using innovative techniques. He is certified in dry needling, has taken coursework in the Mulligan Concept, and has taken coursework in Bloodflow Restriction Rehab. John is a recipient of the 2016 JOSPT Excellence in Research Award for his contribution in a peer-reviewed paper published in the Journal of Orthopedic Sports Physical Therapy. His background in gymnastics and his practice of weightlifting, and circuit and interval training have helped give him insight into the goals and challenges of his patients. 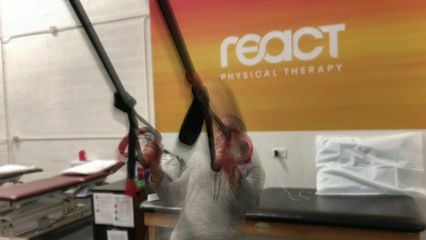 John decided to join the React team to accomplish his goal of helping all his patients meet their full physical performance level through education and individual attention. Jo Dibuz received her bachelor’s degree in Kinesiology from the University of Illinois Urbana-Champaign, and her Doctorate in Physical Therapy from the University of Illinois-Chicago. She enjoys running, previously competing in track and field and cross country, and now participating in events such as 10Ks, half-marathons, the Chicago Marathon, Tough Mudder, and other races for recreation. Jo is also an ACSM-certified personal trainer and uses these skills in her physical therapy practice to optimize patients’ movement after addressing impairments and imbalances through thorough manual therapy. Jo is dedicated to making lasting changes to the body which will not only rehabilitate injuries but prevent future injury in order to maximize each patient’s potential, whether this means being in top shape for athletic performance or simply living pain-free.